Elastic Waistband – From SpongePedia, the biggest SpongeBob-wiki in the world! The Elastic Waistband is a superhero who is seen in the episodes Mermaid Man and Barnacle Boy V and The Bad Guy Club for Villains. He is part of The International Justice League of Super Acquaintances. He is briefly Patrick. He has the ability to become very flexible. His costume is a green suit and blue and red goggles. 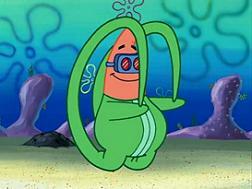 Flexibility; he can bend into different shapes and sizes, and he can finally touch his toes. The Elastic Waistband is a parody of the Fantastic 4's Mr. Fantastic and Plastic Man. In Bad Guy Club for Villains, the Elastic Waistband is first shown in a MM and BB episode in which Patrick and SpongeBob watch, but as a person that is not Patrick's alter ego. This page was last modified on 4 April 2018, at 21:09. This page has been accessed 20,886 times.